After reading some of the reviews on Ellie’s meatloaf and looking over the ingredients I thought that I needed to beef up the flavors in the mix. A few changes here and there and I have what I think is a pretty good and new meatloaf recipe for Michael. I was out of a few things or didn’t have enough so I have shown the substitutes in parenthesis and bold italics after the particular ingredient change. I had two pounds of meat so I bumped up a few ingredients and completely substituted a few things as well. For my friends out west, elk and bison instead of ground beef, but add a fat as the mix will be too dry. Very good for meatloaf lovers and I am glad that I made the changes, full of flavor now and I hope Ellie doesn’t mind me decking out this classic meatloaf…serve with Steph’s smashed potatoes (awaiting permission to publish her recipe). LOL they were the first thing that I considered serving along with a drizzle if the quick sauce made from the remaining “tomato” sauce, pan juices, and strained porcini soaking liquid. I didn’t sauté the mushrooms and onions, but feel free to do so Heat the butter or oil in a large skillet, add the onion and mushrooms and cook until the liquid is evaporated and the mushrooms begin to brown about 8 minutes. Stir in the carrots, tomato paste, thyme and garlic and cook, stirring, 2 minutes more. Allow to cool completely. In a large bowl combine the beef, oats, eggs, Worcestershire sauce, mushroom mixture, salt and pepper. Mix until just well combined. Transfer the mixture to a 9×13 inch baking dish and shape into a loaf about 5 inches wide and 2 inches high. Whisk the tomato sauce, molasses and mustard, save about 1/4 cup and pour the rest over the meatloaf. 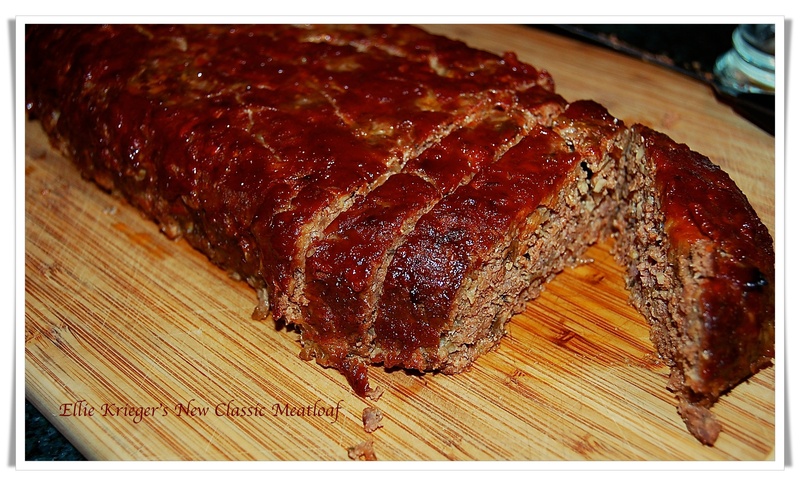 Cook the meatloaf until a meat thermometer registers 160º degrees, about 55-60 minutes. Remove from the oven and let rest 15 minutes before slicing.